We are big fans of the vintage advertising milk bottles (you can find many on eBay) and have quite a few in our collection. 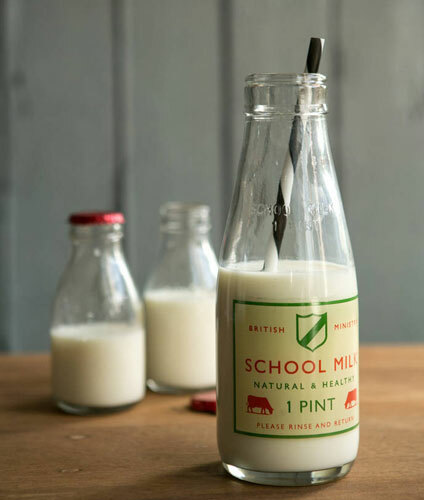 Which is perhaps why we are drawn to these vintage-style School Milk Pint Bottles by Rose & Grey. It’s a classier take on the theme, with these chunkier glass bottle designed purely to add a retro twist to your kitchen or your fridge. Yes, the shape of the bottle is lovely, but the crowing glory here is the graphic, which is very mid-20th century and could easily pass for genuine vintage. Practical too – and looks better holding your milk than a plastic carton. £4.95 is the price of one, which is cheaper than the bottles on eBay.